Description Photocopy of a newspaper clipping. Caption: Lake Grove School Faculty. with an overflow school population overflowing present facilities and classes being housed in the Community church waiting construction of the new units, the new teachers of the school, pictured above, are meeting their problems valiantly. 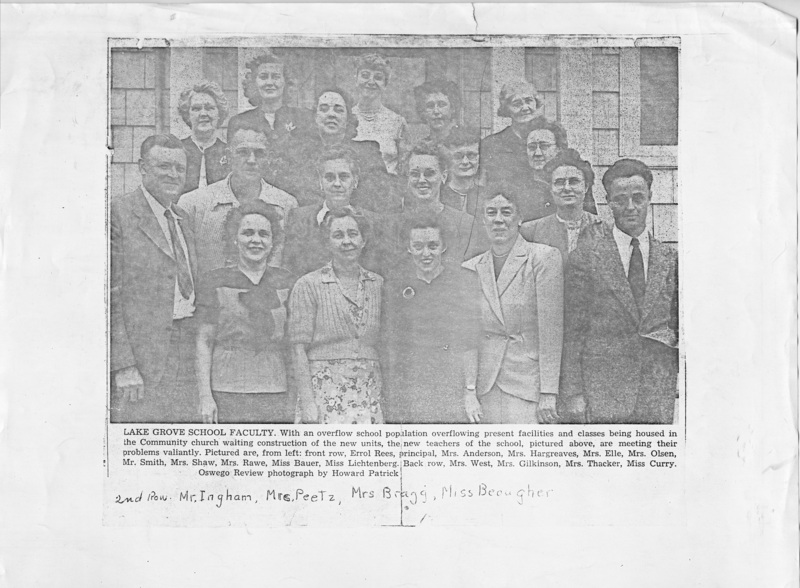 Pictured are, from left: front row, Errol Rees, principal, Mrs. Anderson, Mrs. Hargreaves, Mrs. Elle, Mrs. Olsen, Mr. Smith, Mrs. Shaw, Mrs. Rawe, Miss Bauer, Miss Lichtenberg. Back row, Mrs. West, Mrs. Gilkinson, Mrs. Thacker, Miss Curry. 2nd row: Mr. Ingham, Mrs. Peetz, Mrs. Bragg, Miss Beougher.